The changes from last year's version are quite subtle, but when a program works this well, that's no bad thing. We would have preferred a simpler interface, but Audials One 2019 offers so many options, there are limits to how far back it can be pared. If you want to record videos and music, this is the tool for you – whichever source you prefer. Audials One takes you back to the days of home-made mix tapes, letting you record music from various online sources, including hundreds of online radio stations. Last year's version impressed us with its versatility, so we were keen to see how the 2019 edition shapes up. Audials One’s interface is still a little confusing at first (particularly the home screen, which presents an assortment of radio stations, artists and streaming services at once), but its design has been simplified a little since last year’s edition, with fewer options in the left-hand menu. 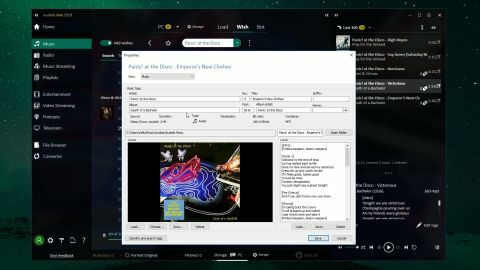 Most significantly, all the various music options have been merged into a single tab, making it easier to find and access some of the software's best tools. To record a song, first you’ll need to add it to your wish list so Audials One 2019 can watch out for it being played. To do this, simply search for the artist, then select the track from the selection presented. Helpfully, songs are arranged by album, so you won’t spend hours scrolling through a long list. You’ll almost certainly find the artist’s entire discography, but bear in mind that less popular tracks are less likely to be played. If you prefer, you can narrow the search down to well-known songs or top hits. You can also specify how many versions of a particular song should be loaded, which stops you being overwhelmed with remixes of tracks. Searching for an artist lets you discover others who you might enjoy, though the mind-map style interface is a little untidy (it only looks good with the program maximized to fill your whole monitor) and duplicate entries are sometimes produced for artist collaborations. Nevertheless, it’s a handy tool, and we particularly like the small slider at the bottom right that allows you to prioritize popularity or similarity of related artists (or strike a balance between the two). If you’re curious about an artist, you can easily look them up on Google, search for them on Wikipedia (just hover over their name and click the menu button) or add them to your wish list (by selecting the plus icon). Once you’ve created your wishlist, click the green ‘Activate list’ button and you’ll be presented with various recording options. You can choose to look for audio files, videos or karaoke versions. It’s possible to just search internet radio stations, but by default Audials One 2019 will also search for tracks on YouTube. This will be much quicker than waiting for them to be played on a radio station, but downloading content from YouTube though third-party services is against YouTube’s terms of service, so it’s up to you if you’re willing to wait or want instant recordings. If you have a Spotify subscription, Audials One 2019 will now use this as well – another new feature for 2019. Once the songs in your wishlist have been found and recorded, they’ll appear in a panel on the right. From here, you can play them to make sure they sound as you expected, and review duplicates to make sure the best quality recording is selected. If you've used a previous version of Audials One, you should notice an improvement in streaming quality for 2019, but you can make various tweaks to get everything sounding perfect, including trimming the beginning and end of the track. You can also normalize volume (handy if you’re using songs from various different sources) and then add it to a playlist, or export the song to a folder, Windows Media Player, VLC Media Player or iTunes. It’s even possible to turn it into a ringtone. Audials One 2019 typically does a great job finding song metadata (including album art and lyrics), but if there’s anything missing, you can add it manually by right-clicking the track and selecting ‘Properties’. One of our favorite features in Audials One 2019 is the ability to find and record podcasts for listening later. You can search for a subject, or simply type in a title if you know exactly what you’re looking for. It’s incredibly convenient, and you can easily play or download the latest episode straight to your PC. There’s also a built-in screen recorder, which allows you to record from any source. It’s chiefly designed for capturing video while they’re playing, but you can use it to record anything that’s happening on your desktop, eliminating the need for dedicated screen recording software. You also get a superb file converter, which supports pretty much every video and audio format you can think of. Developer Audials has taken some steps to simplify the software's interface, but we still find it a little cluttered, and discovering how to perform some tasks is still a case of trial and error. That aside, there are some great improvements in Audials One 2019, including better audio quality and more recording options. Just make sure you're happy with the terms of any site you choose to record from – this tool gives you a lot of options, but it's up to you which ones you use.